It is well-known that Dr. Sagan was not religious – he described himself as agnostic, believing he had seen no proof of a supreme being. 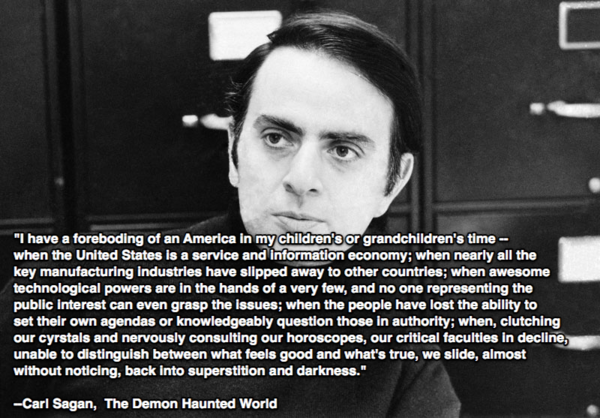 His 1995 book, The Demon Haunted World, was about using the scientific method and critical thinking instead of superstition and pseudoscience. But I doubt he would have expected that his description of America in the quote above would have happened so quickly, or that we got there in the way we did. He seemed to believe the “New Age” trends he saw in the 1980s and 90s might grow, and that the much-publicized decrease in our ability to educate our students would result in an overall dumbing down of America. He himself did what he could to keep that from happening. I doubt he thought, though, that only two decades after he wrote those words we would have fallen so far and so willingly. Hat tip to Scott Lowther and his “Up-Ship” blog for tipping me off to this one. According to this information from Lockheed, they have a way to combine a regular jet turbine engine with a ramjet that could power a Mach 6 aircraft. 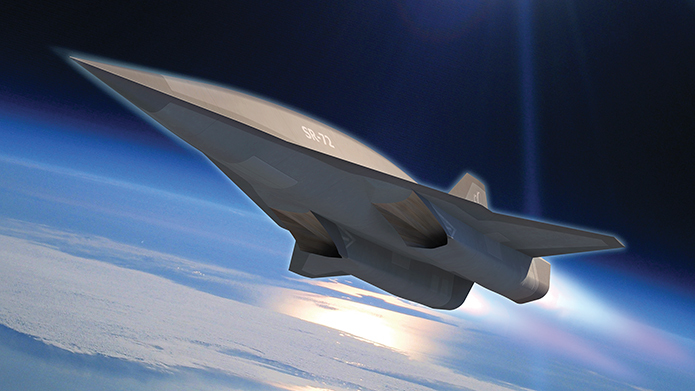 Calling it the SR-72 as a nod to the famed SR-71 reconnaissance plane the Lockheed Skunk Works built in the 1960s, this one is to be unmanned – like pretty much every military plane on the drawing boards. I just hate it that they announced way before they bent any tin, though. The X-33 disaster of promise-oops- can’t deliver is still too fresh in my mind. (In defense of Lockheed, though, a lot of the problem with getting the X-33 demonstrator flying was political. Interference by Congress has a way of screwing up programs like that. Well, any program, really. ) Saying they may have this operational by 2030 sounds like a long way off, but the F-35 Strike Fighter has been in development really for over 12 years. They are just barely getting production aircraft out to the USAF now, seven years after the first prototype flew. If anyone can do it I figure Lockheed will. But why announce it so early? 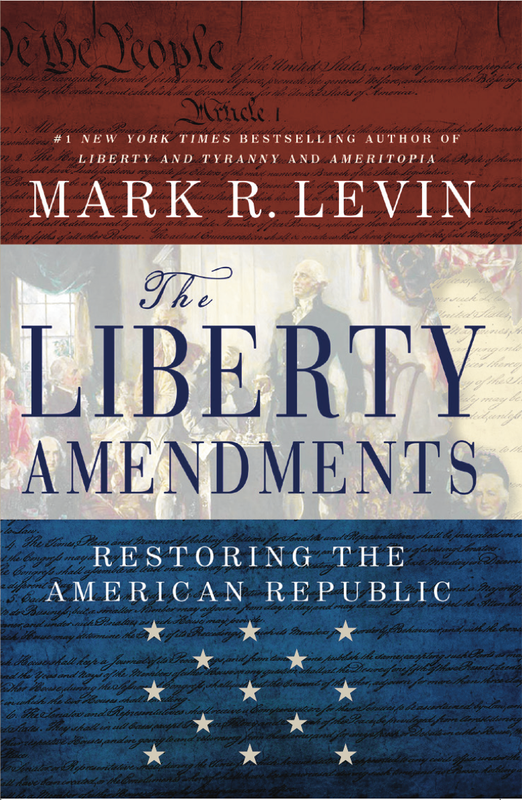 I wrote a couple more new posts over at Keep Americans Free. I invite you to take a look. No, I mean it. Go buy it. Now. It may have the answer to the only way we can get ourselves out of this Washington mess, once and for all. The updated version of the SpaceX Falcon 9, with extended fuel tanks and redesigned engines, successfully launched from Vandenberg AFB today. 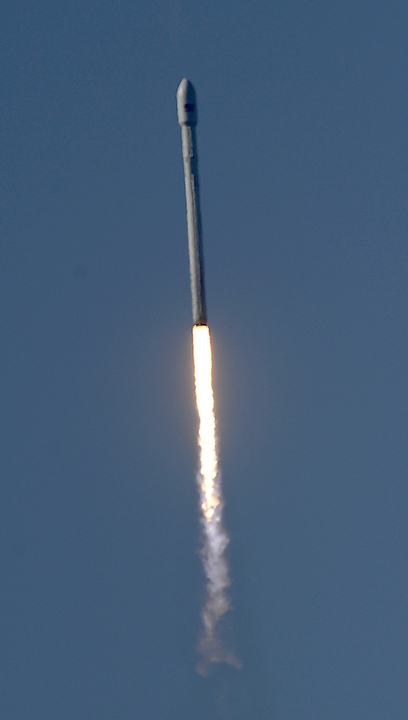 It put a Canadian weather satellite into a polar orbit, along with five other small satellites. SpaceX will attempt to recover the first stage from the Pacific if possible, paving the way for developing a completely reusable stage that will soft-land vertically. There is a beautiful graphic on the SpaceX site that shows the redesigned vehicle, including some very cool-looking fairings designed to hold the landing legs that later models will have. As you might imagine from the company headed by the same man that heads Telsa Motors, the new design including the fairings looks very aerodynamic, in a new-Star Trek-Enterprise sort of way. From the blue LED lighting inside the Dragon spacecraft to these fairings, SpaceX is doing what it can to make commercial spaceflight not only viable, but stylish. 1. This should never have received national attention. The fact that it did has more to do with the manipulation of public opinion (by a number of folks, not just the Guv’mint and/or Big Media) than with the facts of the case. 2. I guess we should be glad that there is nothing else important going on in the US of A that we all can be so concerned about one self-defense case in Florida. Sort of like hanging on for every little thing the Kardashians do. We have no big issues? 3. I’m tired of those would would like to mold public opinion treating every event as something requiring a “national dialogue.” This is code for “Let me on CNN,” friends, pure and simple. We have to fill a 24-hour news cycle, the talking heads have to talk, and they know that people are bored with discussions of things like trade issues with China, or why nuclear power might actually be safer than other ways of creating electricity. I don’t know if it’s study of the demographics or wishful thinking – probably some of both – but any sitcom on network TV shows you what the TV folks in New York think of your level of intelligence. Why should you expect news to be any different? I suppose it’s a variation on “if it bleeds, it leads,” but this is why I no longer watch local TV news and don’t get a local newspaper – too low a signal-to-noise ratio. Limbaugh calls some folks “low-information voters” and that’s who the networks tend to pander to. They could elevate the level of discussion, and enlighten as well as entertain, but I think that ship sailed during the Vietnam War. That’s when they found they could mold public opinion based on the images they showed us on television. 4. This case was never about racism – except for those people who tried so hard to make it so. It was a case of a person who felt his life was threatened, and within the laws of the State of Florida, was he justified in his response. That’s it. The jury was not supposed to determine if Zimmerman feared all black people, just if he feared for his life, and if his actions were within the limits created by Florida law. Frankly, I see all the racism coming from the folks who have been wringing their hands about the “poor, black child” who was killed. I’m sorry it happened as well, but we have established a black thug culture – it is in the media, the music, in the way folks dress. It comes from gang membership. Whether this young man was in a gang or not – he presented a threatening appearance. I’ve seen it happen in Chicago hundreds of times. Posturing is important in certain cultures. If that was what he did, and then provoked Zimmerman, and then they fought…how many other folks would have had the same response? 5. And while this one case occupied thousands of hours of TV and radio coverage, the continued widespread killing of innocent bystanders in Chicago by gang members goes on unabated. Let’s have a “national dialogue” about that, okay?